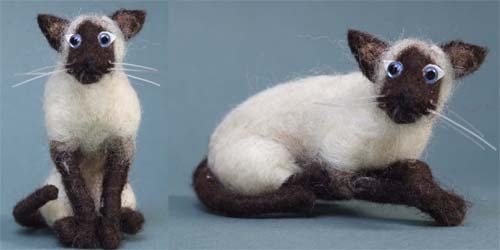 Shermese was hand sculpted over a wire armature by repeatedly working raw wool with a felting needle until it formed the desired shapes that can be used to make up a feline with the various colours added as applicable. The wire armature allows the finished cat to be repositioned as shown in the pictures above. The whole process took around 4 days to complete.